Passive fire protection materials insulate structures from the effects of the high temperatures that may be generated in fire. They can be divided into two types, non-reactive, of which the most common types are boards and sprays, and reactive, of which thin film intumescent coatings are the most common example. Thin film intumescent coatings can be either on-site or off-site applied. 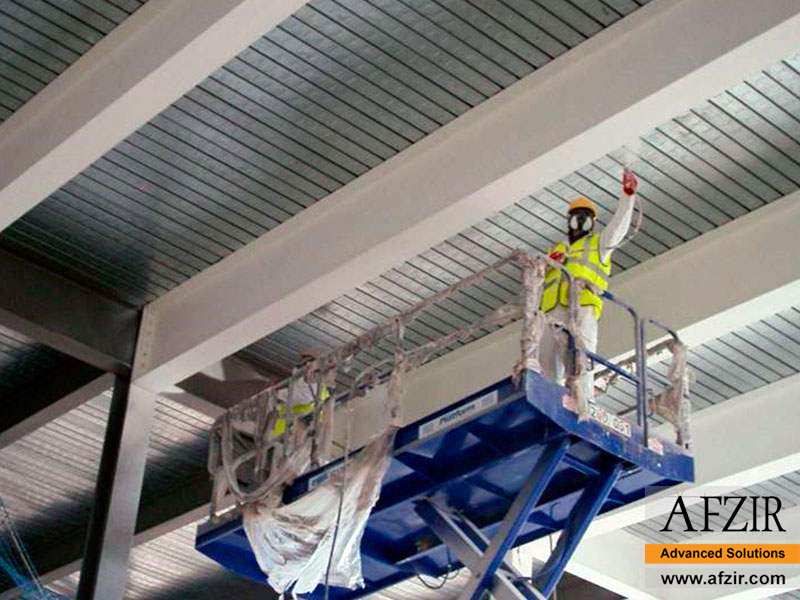 The most common use for intumescent paint is to provide an aesthetically pleasing finish on exposed structural steel members. Typical spray applied fireproofing provides a thick and spongy surface that requires a finished surround to hide and protect the steel member. Intumescent paint provides the same level of protection in a coating that looks like a thin layer of paint. A spumific agent which decomposes together with the melting of the binder, to liberate large volumes of non-flammable gases. These gases include carbon dioxide, ammonia and water vapor. The production of these gases causes the carbonaceous char to swell or foam and expand to provide an insulating layer many times the original coating thickness. They are mainly used in buildings where the fire resistance requirements are 30, 60 and 90 minutes. In recent years, a number of products have been developed which can provide 120 minutes fire resistance. They can be applied either on-site or off-site. In general, most on-site application is carried out using water based materials. However, where the structure to which the material is applied is not to have an end use in a dry, heated environment, solvent based materials are commonly used. Solvent based materials also tend to be able to cover a wider range of section factors than water based materials and can be used on-site to protect smaller sections requiring high thicknesses.